The 18-year-old singer-and-actress - who announced she was quitting her Disney show 'Sonny with a Chance' yesterday (19.04.11) - underwent three months of treatment for an eating disorder until January, and while in the residential clinic she discovered she was bipolar. 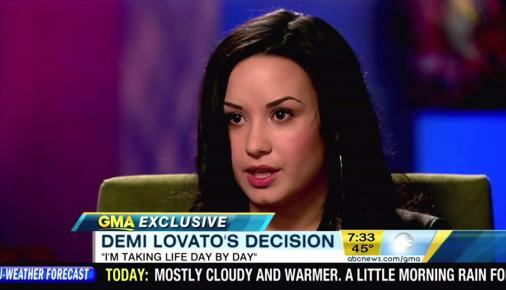 She told People magazine: "I never found out until I went into treatment that I was bipolar. Looking back it makes sense. There were times when I was so manic, I was writing seven songs in one night and I'd be up until 05.30 in the morning. I feel like I am in control now where my whole life wasn't in control." The teen star is now dedicated to helping other people as a result of her time in a clinic. She said: "What's important to me now is to help others." Demi recently revealed she felt "proud" of Welsh actress Catherine Zeta-Jones, who recently underwent treatment for Bipolar II disorder. She wrote on twitter: "I don't know Catherine Zeta-Jones personally but what she has decided to do it SO brave.. And SO difficult but worth it... I'm proud of her (sic)."